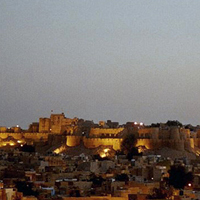 It is situated in Jaisalmer city in Rajasthan. The fort stands admist the golden stretches of the great Thar Desert, on Trikuta Hill and had been the scene of many battles. It is also known as the "Golden Fort". It is built of sandstone and is one of the largest forts in Rajasthan. It was built in 1156 AD by the Bhati Rajput ruler Rawal Jaisal, from where it derives it name. At one point of time the entire population of Jaisalmer used to live within the fort; but with the increase in the population, people was forced to move out and find shelter under the foot of the Trikuta Hill. The main attractions inside the fort are: Raj Mahal (Royal palace), Jain temples, Laxminath temple, 4 massive gateways, Merchant Havelis.